Paul opens his letter to the community at Corinth with a prayer of blessing; Blessed be God. Paul emphasizes how God has blessed and encouraged him in his apostolic ministry. He wants the community to see that God is working through him, even when his ministry has affliction. Paul blessed God as the God and Father of our Lord Jesus Christ. We now see Jesus associated with God the Father. We as members of Jesus Kingdom are able to receive from the Father everything He offers for Jesus His Son. As Jesus is precious to God so are we and God will always be ready to keep us from destruction. God is a Father of compassion, meaning He enters into our day to day living and walks alongside us in all we live. We are no longer on our own but have the Creator of the universe as our companion. God is also a God of all encouragement. God knows as a follower that suffering, affliction and delay will come our way, but God is there to be sure we get through it. God gives us strength in the form of His Spirit, and with strength we will not only persevere but will do so successfully, joyfully and encouraged. We may often think that we should only go to God with big concerns, and issues. But Paul wants us to know that God cares about everything in our life. A small smile, a little tear, a broken heart and joyful relationships. God walks with us through everything. 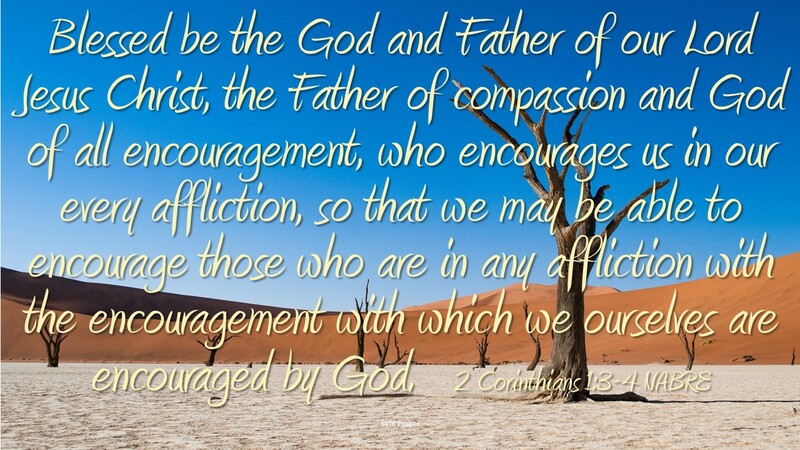 Like God, we should also walk and encourage others being compassionate and God like. Do you invoke God every moment of your day? Do you pass along encouragement?